Doing the laundry is not typically on people’s lists of favorite things to do, but dealing with stains is even worse. There are lots of stain removers to choose from in the supermarket, but most of them are chemical cocktails. Sure, these stain removers can be very effective but they aren’t very friendly to the environment. They can also be harmful to us, because traces of these stain removers stay behind in our clothes which can have a negative impact on our skin and body and cause allergic reactions and irritation. Luckily there are more natural stain remover options available that can still do a very good job at removing stains from our clothes and carpet. Is it just me, or do we always somehow get stains on our favorite clothes? And not to mention children who have absolutely no fear of dirt and don’t care too much about what they’re wearing. In other words, it’s important to have a look at alternative natural stain removers that help keep our clothes clean. You can use white vinegar as an efficient cleaning product in so many ways. Try a combination of dish detergent and white vinegar to treat greasy stains from sauces. Follow this two-step process to effectively get rid of these types of nasty stains. Another way to effectively use vinegar is to simply add a small cup in the wash. This works really well when you have a lot of smelly, sweaty clothes in your laundry basket. Vinegar also works surprisingly well for cleaning kitchen appliances, such as ovens, stoves and even your coffee pot. Check out these 30+ ways to use white vinegar for even more great ideas! For nasty fruit stains it’s as easy as putting water to the boil to get rid of them. Household Management 101 claims that pouring boiling water directly on/over the stain will allow it to penetrate the fabric and effectively remove fruit stains. According to Food52, submerging the stain in a bowl of white vinegar for about an hour after pouring boiling water in a steady stream over the affected area will remove (most of) the stain. If this process hasn’t yet completely removed the whole stain, apply whitening toothpaste to finish it off. Interesting! One way to use baking soda is to simply sprinkle some of it on a wet stain and let it sit for about half an hour before washing. Baking soda mixed with vinegar also works really well as an effective natural stain remover, especially with greasy stains. Good Housekeeping has a list of great tips on how to best use baking soda as a household cleaning product. Did you know that you can get your shoes to smell like brand new just by using a bit of baking soda? Hydrogen peroxide is an affordable, nontoxic chemical that can be used in so many ways in your home. If there is one thing that hydrogen peroxide is really good at then it’s the removal of all sorts of stains from clothes and carpet. Dirty sweat stains? Soak the stain in water mixed with hydrogen peroxide (50/50) for about an hour and then add some hydrogen peroxide to the wash water. Hydrogen peroxide combined with baking soda and vinegar has also proven to be a very effective stain remover mixture. Check out these 15 tips on how to effectively use hydrogen peroxide in your household. The most natural way to remove stains from clothes? Natural sunlight! This may not be the most effective way to target stains but it does work with smaller and less aggressive stains. 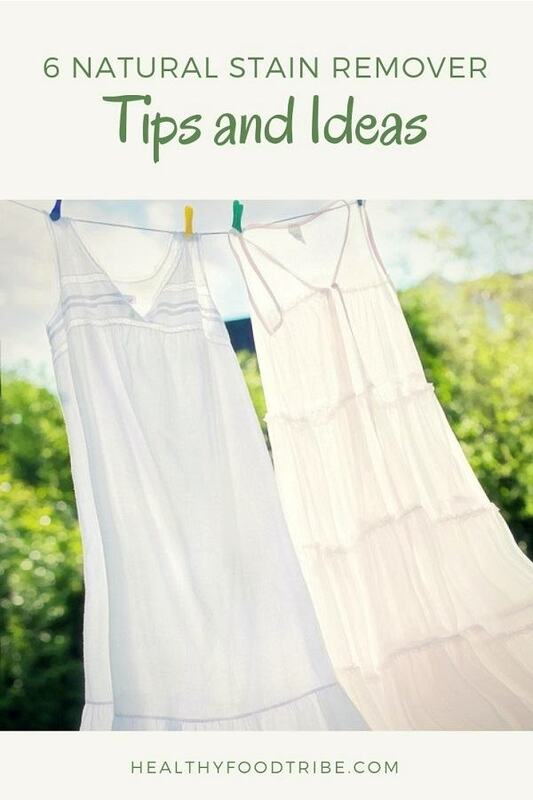 Simply treat the stain with warm water and hang it outside in the sun. The warm and bright rays of the sun can be surprisingly effective. Instead of using only warm water, you can also first treat the stain with one of the above mentioned ways – for example with hydrogen peroxide – before hanging outside to dry in the sun. Denatured alcohol (methylated spirits) may not be the most obvious stain removal product to think of, but it’s perfect for removing paint stains from wood and to clean paint brushes. It’s also very effective in removing glue and sticker residue, as well as removing ink stains. For clothes, use a small bit with hot water to remove stains from grass and paint. Check out our list of domestic uses of denatured alcohol if you’d like to read more about how to effectively use this product in your household. Here’s a tip that I do with my washing machine. You may be surprised to know that a washing machine can get really dirty on the inside after months of use. A good way to keep your washing machine clean – so your clothes get cleaner too – is to do an empty wash with some baking soda and vinegar. Do this at least once per season and your washing machine will remain free from germs and unwanted traces of dirt. One last tip I’d like to share with you is to use the quick-wash option more often. This setting gets ignored too easily, assuming that it doesn’t do a good wash, but that’s actually not true. The quick-wash setting does a great job – especially with a normal laundry load – and is much environmentally friendlier than the long cycles on hot water. Less energy and far less water! As a general rule of thumb, it’s always best to treat a stain as soon as it happens. It’s easier to remove a stain when it’s still fresh and not yet fully absorbed by the fabric. 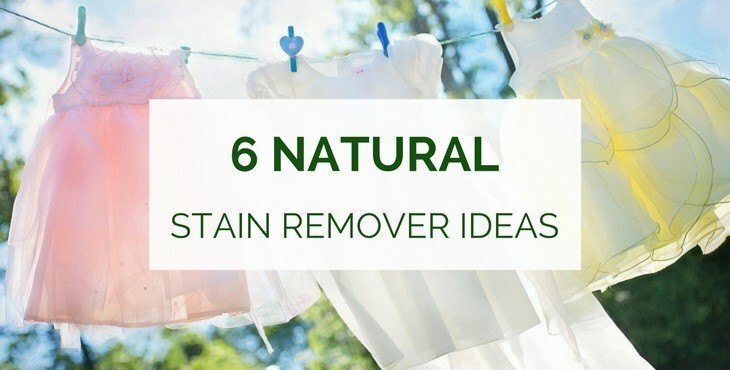 Hopefully the above natural stain remover tips can help you to get rid of those unwanted stains in an environmentally friendlier way. Please try them out and see of they work for you. I would love to hear your ideas too, as I’m sure there are a million more ways to effectively remove stains from your clothes and carpet!